This Eden Prairie dining room is well proportioned and has large windows, wood floors and a view into the lower-level family room. But the space felt dark and cluttered. "Even with the lights on and blinds open, the space felt a little dreary," said Lori Matzke of Centerstagehome.com. "We wanted to give the room a boost and make it feel as vibrant as the cheerful color on the walls projected." 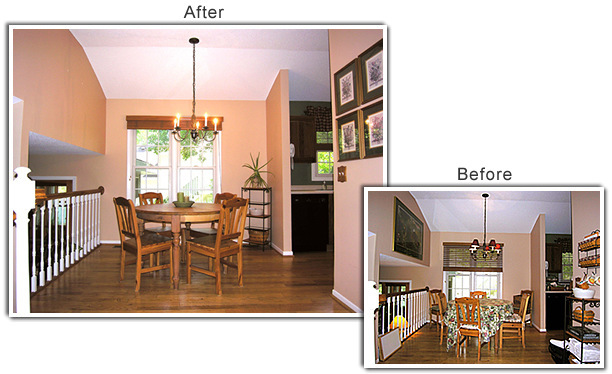 Bright, sunny spaces are always more attractive to buyers, she said, so the goal was to make the space feel lighter. Removing the oversized artwork makes the space feel more open and airy and helps draw attention to the high ceilings. To bring more light into the room, Matkze opened the window blinds and removed the lampshades from the chandelier. The wire wall shelf and stand were moved to the far corner of the room to create a break in the wood tones of the floor and table, to attract more attention to the far side of the room and to increase access into the room. The tablecloth and seat cushions were removed because they tend to draw attention directly to the table and away from the room's best features. "I never use tablecloths to stage, no matter what kind of shape the table is in," said Matzke. Two extra dining chairs were placed in storage. To keep the buyer's eye moving around the room and help visually connect with the green walls in the adjoining kitchen, Matzke placed several green accessories around the room, including a set of four framed pictures, an aloe plant and a centerpiece made from scented candles and a ceramic bowl filled with rocks from the driveway.